Obtaining one of the many nursing scholarships in Virginia can help ease the financial burden of attending nursing school. Our research has led us to several scholarships specifically created for students in Virginia looking to further their education. Some nursing scholarships for Virginia students have strict eligibility requirements such as the student must plan on working in the State of Virginia after graduation. Requirements do vary from scholarship to scholarship and some requirements can range from being a member a specific organization to current academic history and the level the student is studying. Everyone knows that it is hard to come up with the funds for tuition, books and living expenses. With nursing scholarships in Virginia, students can ease this burden and rely less on loans and savings. 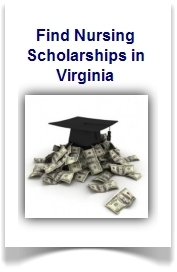 The state of Virginia is blessed to have so many scholarship opportunities available and the awards that are listed below will give you a brief idea of what types of financial aid is available. Virginia College Scholarship Assistance Program - This is a need based award established in 1973 for public or private colleges in Virginia. The deadlines vary. Virginia Commonwealth Awards - This award is for undergraduate and graduate students in need of financial aid and can be granted to both in state and out of state students. The award is dispersed to the students with the most needs. The deadlines and procedures for the applications are available at the financial aid office at the school attended. Virginia Guaranteed Assistance Program - This award is an incentive program to assist needy students with their education currently attending school. Virginia War Orphans Education Program - This is an award for children or surviving children of a veteran of the Armed Services to continue their education. Bridgewater College Lantz Scholarship - A scholarship awarded to those who attend the Linville Creek Church of the Brethren who have a 3.2 GPA or may have graduated from the Broadway High School. The deadline for this award varies. Virginia Tuition Assistance Grant Program - This program is a non-need based award program for financial assistance for private of public college students. Applications must be in by July 31st prior to the semester but no later than December 1st. The majority of scholarships for nursing students in Virginia are based on if the student resides in Virginia and plans to work in Virginia upon graduation. The student that is enrolled in a Virginia based educational establishment and is in need of financial assistance will be the first priority for most of the scholarship programs. Besides this list of state specific Virginia nursing scholarships, there are also national scholarships for students attending nursing schools in Virginia. One of the most popular nationwide nursing scholarships you might want to check into is the Johnson and Johnson nursing scholarship. Make sure when performing research for a specific scholarship you know exactly what your needs will be. These needs could include tuition, books, on campus housing, living expenses, and even funds for your nursing uniforms. Also make sure that you qualify before applying. For example, the Bridgewater College Lantz Scholarship requires you to be a member of the Linville Creek Church of the Brethren and a graduate from the Broadway High School. In the end, nursing scholarships in Virginia are put in place to help students who have a desire to further their education. If you need assistance when applying for a scholarship, seek help from the financial aid office of the college or university you plan on attending. They will be able to help you not only find additional money you might qualify for, but also assist with the application process for better results. Nursing Salary In Virginia: How Much Do Nurses In Virginia Make?